The British Airways i360 is now open. The 162 metre viewing tower in Brighton was built by the team who created the London Eye, the most visited paid-for attraction in the UK. The British Airways i360 opened in August 2016. To support the building of the i360 councillors agreed to take out a government loan and pass it on to developers. The loan is from the Public Works Loans Board (PWLB) – a government funding agency who make loans available to major building projects. The i360 is projected to earn three times more than it needs to cover its loan repayments. The council receives three separate streams of income from the i360. We've set aside income for investing in the seafront, helping enhance the area and bring in more business and revenue for traders. ​Income from Business Rates will support the funding of all council services. We get to keep 50% of the Business Rates paid by the i360 under current government regulations. 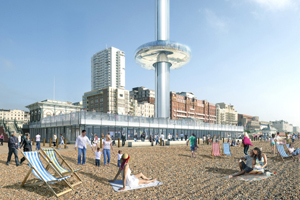 As the i360 is unique, a specialist valuation will be carried out to decide how much the Business Rates will be. Money from Business Rates supports the funding of all council services. We will receive money from the i360 to pay for the £36 million Public Works Board Loan. The payments from the i360 are expected to exceed the loan repayments by about £1 million every year. We will use some of the money for landscaping work on the seafront. Councillors will continue to make decisions about other seafront projects to fund. We've also received just over £960,000 of fees from the i360 for the arrangement of the £36 million Public Works Board loan. This money will be spent on landscaping work on council owned property around the i360. Find out more about the funding of the British Airways i360 on their website. Find out more about how we're improving the seafront. Plans for a major development on land next to Brighton’s West Pier were submitted to the council on Monday 17 July 2006. Additional information was submitted on Friday 8 September 2006. Planning permission and Listed Building Consent for both applications was granted at the Planning Applications Sub-Committee on 11 October 2006, subject to approval by the Government Office for the South East. All of the plans, drawings and other supporting documents, including the additional information submitted, can be accessed on our planning register. Go to application numbers BH2006/02369 and BH2006/02372. For further information on non-planning related aspects of this project, please read the questions and answers below or contact Major Projects & Regeneration on 01273 292553 or e-mail mpt@brighton-hove.gov.uk.